With the first weekend in almost four months of winter to have minus single digit temperatures, I had made some plans to go fishing. Sadly, most of them fell through. Friday was spent in pursuit of black crappies with very minimal success, although an enjoyable day was had watching Olympic hockey on a smartphone as we fished. It was a full moon that night and some very big marks showed up on the flasher that day, but none of the big ones committed to my offerings. Saturday rolled around and my fishing buddy was too sick to go and we rescheduled for Sunday, although he was still to ill to go then. 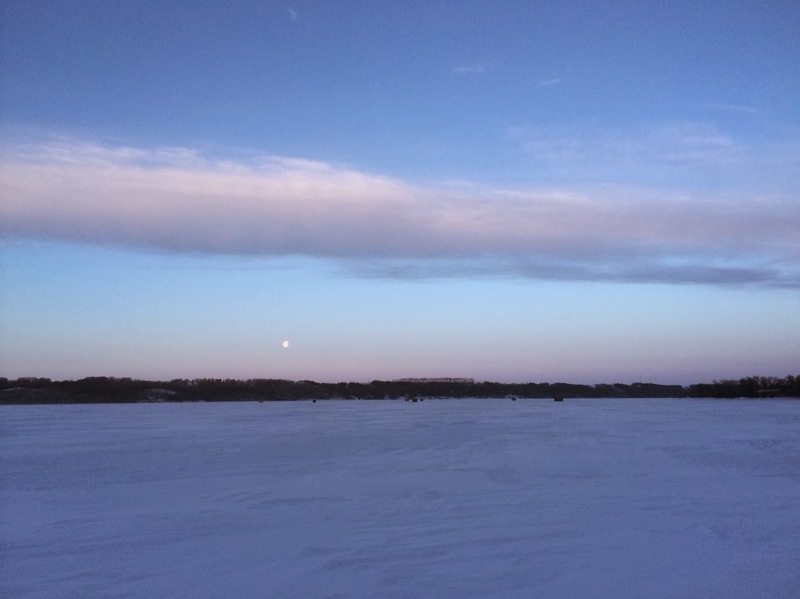 I couldn't believe it, full moon weekend, highs of minus two and I wasn't out there to fish it. I could've went out alone but really prefer not to. As Sunday evening wore on the phone rang, and a fishing opportunity for the next day presented itself, as long as the extension for the auger was bought by a friend over the weekend. I was so excited to go fishing and had to be up at 4 am, I got everything ready before getting to bed around 1 in the morning, Waking up came easy this time, I needed to wet a line and land some fish in the worst way. The initial 40 kms of our drive were snow covered, with the ditches full up to the road, it was tough to stay on track. Heading west the roads got better and we made it to the access point with an hour before sunrise, finding three to five foot snow drifts. It was clear we weren't making it through, so we quickly found a place to park and unloaded our gear, kicking ourselves that we left the sled at home. With the clouds fading away and the moon slowly setting we grabbed the essentials and trudged on through the snow to a spot we had success at a week ago, away from the crowds. 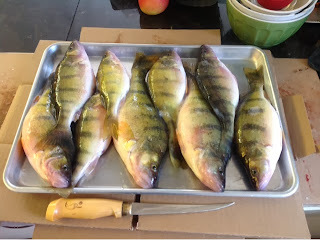 On that note, a lot of folks when talking about where to start on a body of water will say just head to where the ice huts are, they are there for a reason, That may hold true, but often they are placed on hot morning or evening bite specific locations, or a species you may not be after. On the other hand the fish in those areas receive more pressure than lets say away from the shanty towns a few hundred feet or even a kilometer or two. We learned the weekend prior that away from the crowds produced exponentially better than being in amongst them after talking to a few different anglers that were out on the same body of water. That morning we were set up in amongst the shanty town and caught five fish in 4 hours, after that we made a move and were at least 1/2 a km away from anyone and hammered the perch. That one move away from the crowds payed off. Out at our spot, we ended up drilling six holes each twenty feet away from the next and got to fishing. The sun was still below the horizon and the wind was picking up, the marks started to appear on the flasher and it wasn't long before I missed a bite, I blamed the wind. A few fish were landed twenty feet away and although the day was supposed to be a nice one, we decided with the wind making bite detection difficult and lines icing up, to drill a shack pattern of holes and set up the shelter. 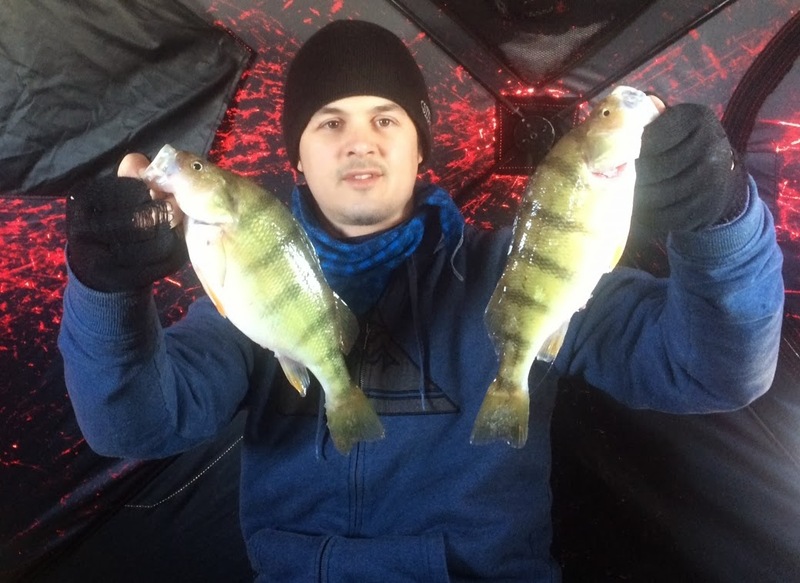 All set up and lures down, it was game on from the get go, the perch were very aggressive flying in and hammering our different lures. I was starting with a minnow deadsticked on a moon drop jig and quickly found out it was looking like more of a one rod and line kind of morning as I could not keep up with the action on both rods missing more than I was landing. 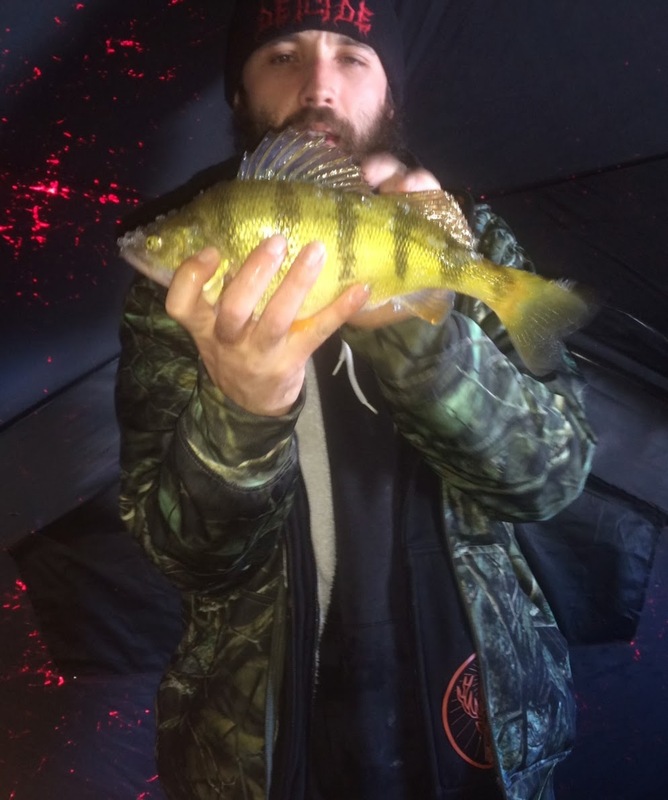 This is what we were here for, non stop perch action below us with multiple double, triple and even quadruple headers as Jay stuck with two lines. As the morning wore on, more and more trucks plowed through the deep snow making there way out to fish and eventually a tractor and blower cleared the access, by lunch I'd say there were at least 150 vehicles out by the shanty town with maybe 6 away from it with two groups about 150 feet away south and north of us. All sorts of lures were working well for us but I just couldn't work up the courage to use my darter with out it being tipped with a minnow (I know it effects the action). Frodo on the other hand was hammering them with a Salmo chubby darter without it being tipped. It was a good day to be out, clear blue skies, minimal breeze and the sun radiating off the crusty snow. Having to leave earlier than we usually do wasn't a big deal, the action had been steady all day, more than enough fish were landed with enough for a meal kept and the rest released. The pack up was easy in the mild weather but the walk back with the extra weight was brutal, I will never forget the sled again. 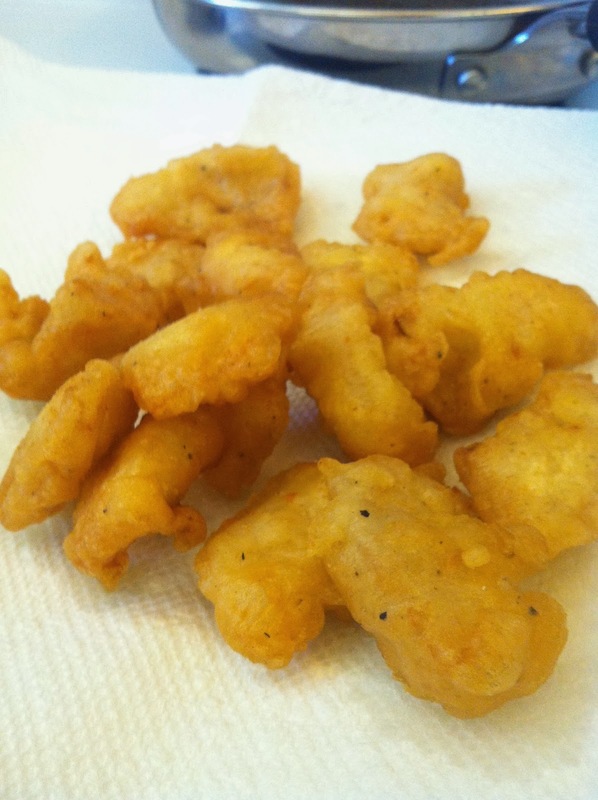 The fish fry the next day was an added treat, tempura perch chunks with some battered vegetables and some home made dipping sauces, there's nothing better than fresh fish out of cold water.